The ravine known as Helver’s Cut presents a major obstacle to traffic between the Amber Woods and the port town of Seever’s Mill. The ravine was cut into the landscape by waters from the Black Mire running towards the ocean. Fortunately, few have need to cross the ravine, but for those that do the options are to circumnavigate it, or to cross at the Howling Orc Bridge. The Howling Orc Bridge is the last visible remnant of a fortress that was built here and then razed during the great war. The surface ruins of the fortress are near the massive stone span that crosses the ravine. The bridge gets it’s name from the wind that whips along the hidden bottom of the ravine along the river, creating eerie echoes and strange whooping howls depending on the strength of the current. A second bridge can be seen below the Howling Orc Bridge, a hundred feet further down into the ravine. Occasionally massive spiders can be seen on the lower bridge, setting webs for the birds and other animals foolish enough to fly through the ravine. The lower bridge also serves as a reminder that the old fortress was more than just a surface construction, and those that cross here posit that there must still be some way to access the old dungeons under the fortress. Howling Orc Bridge was drawn in a single draft using a pair of Sakura Micron pens on standard 5-square-per-inch graph paper. It is presented here for your non-commercial use thanks to the awesome support of the many patrons who support the blog through the Patreon Campaign. This map is now made available to you under a free license for personal or commercial use under the “RELEASE THE KRAKEN” initiative thanks to the awesome supporters of my Patreon Campaign. Over 300 awesome patrons have come together to fund the site and these maps, making them free for your use. Incredible, as always. Thank you. Excellent map. I love the cross-section. Very cool. 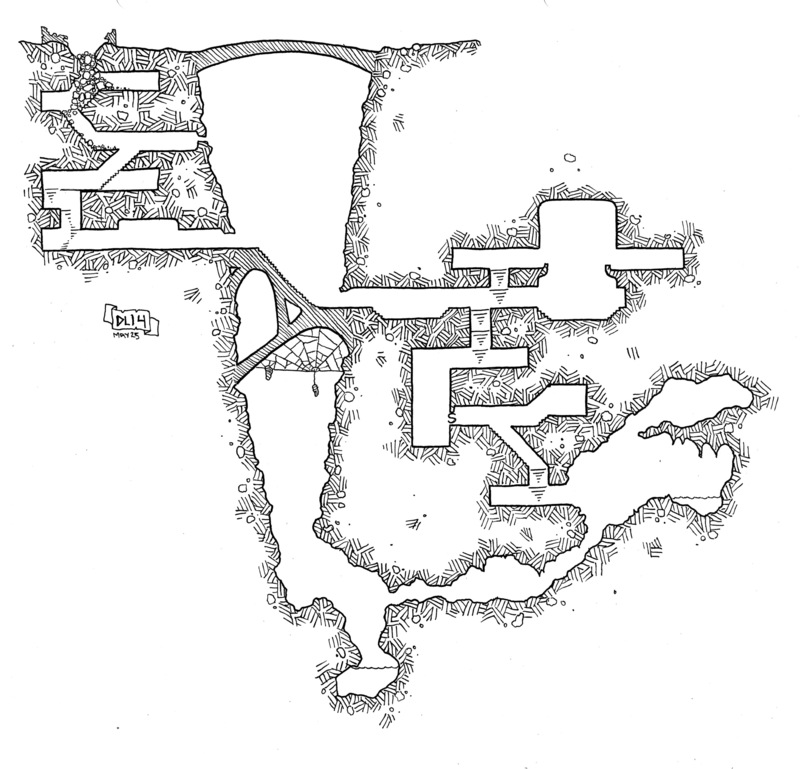 In fact, it reminds me a bit of Goblin’s Gully, which was the first map of yours that I ever took note of. Thanks so much for sharing!